Now, it’s not easy to release everything unto the Lord. This is an act of faith. But, as your faith grows, and you see the manifestations of the Lord’s work in your life, it becomes easier. And take a few minutes to listen to the song at the end. It’s time to believe all the great things the Lord thinks of you and has in store for you. Oh Lord, my God, You alone know what I am going through. 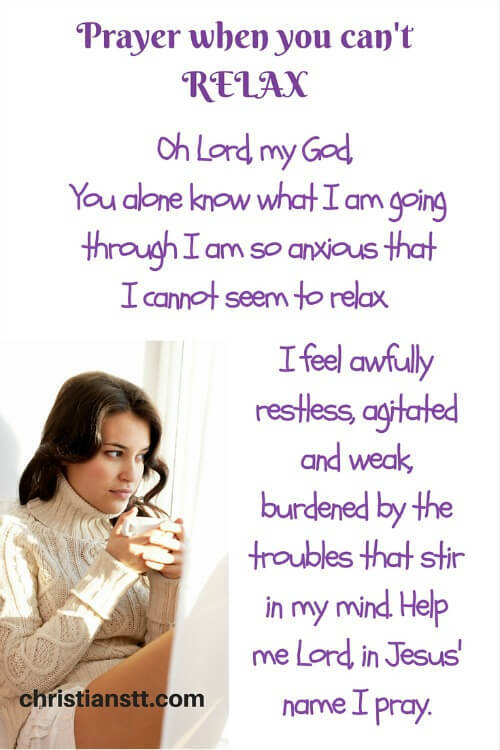 Lord, I am so anxious that I cannot seem to relax. At this point I feel awfully restless, agitated and weak, burdened by the troubles that stir in my mind. I cannot sleep. I hardly eat and I am constantly on edge. My heart is extremely heavy. My body is totally exhausted. And I feel as though I cannot go on. Psalm 127: 2 It is in vain that you rise up early and go late to rest, eating the bread of anxious toil; for he gives to his beloved sleep. Father, I need You, right here, right now! Work within me so that I may find the peace that I once knew. Silence the noise that surrounds me, as I pray that the peace of the Lord be upon my life wherever I go. Lord, guide me as I submit this humble prayer to You. I request peace in my heart, the peace that surpasses all understanding. Ease my worrying mind, as I lay down my burdens at the foot of the cross. Allow me to relax today and rest peacefully tonight, as joy rises with You in the morning. Embrace me in Your comforting arms, as I am healed and touched by the power of Your warm love. Father, bring me through these testing times. I declare and decree that every stronghold in my life is demolished, every sin is washed away and every chain of anxiety, doubt, fear and dismay is broken, in Jesus’ name! Amen! Philippians 4:6-7 In nothing be anxious, but in everything, by prayer and petition with thanksgiving, let your requests be made known to God. 7 And the peace of God, which surpasses all understanding, will guard your hearts and your thoughts in Christ Jesus. Matthew 11: 28-30 Come to me, all who labor and are heavy laden, and I will give you rest. Take my yoke upon you, and learn from me, for I am gentle and lowly in heart, and you will find rest for your souls. For my yoke is easy, and my burden is light. “You Say” resonates with many people on many levels. Know that you are loved. You are not alone. If you are struggling with thoughts of suicide there is hope and there is help.